Advertisers don’t take a nap. They keep looking for ways to push their adverts as close as possible to their target audience and in doing so, won’t mind using the technology to do the magic for you. One such revolutionary technology is the “push notification”. If you’re an avid user of smartphones especially, then the push notifications must not be something new for you. However, for the advertisers, this is certainly quite novel. Push notifications are quite effective, provided they’re deployed smartly. However, until recently, the advertisers were forced to create their own app or software in order to reach their potential customers through this route. Therefore, there was space yet to be explored and exploited. Megapu.sh (pronounced as Mega Push), realizing the potential, was quick to jump the gun. Hence, an ad network for advertisers to convey their messages through push notifications comes into being. 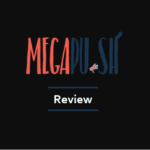 This MegaPush review will explore how the innovative advertising network is breaking barriers for the advertisers and thus resulting in higher conversions and sales closures. Additionally, we can also see how you can be a part of this network and become a successful digital marketer. Having said that, this also needs to be conveyed that The Usual Stuff does perform reasonable diligence on its part to ensure the credibility of the product/service being endorsed. MegaPush is an advertising network that allows its members (advertisers) to advertise and reach their target audience via push notifications in both mobiles and desktops. A push notification pops up on the home screen of your phone or computer. You don’t need to open a respective website or email to read these notifications. They’ll appear right in your home screen. 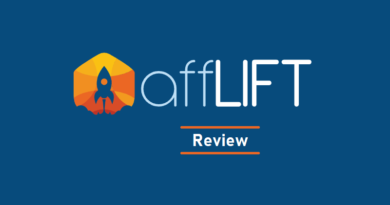 Thus resulting in more responsiveness as the barrier of additional effort of logging on to any particular website is lift-off. Hell yeah, they’re effective. In addition to the above link that I’ve shared, let me also impart my own experience (being on the receiving end). A few months ago, I subscribed for the notifications from a website which mainly deals in the articles related to WordPress and blogging. This website deploys push notifications which I receive right into my laptop’s home screen. In fact, most of the time, I receive them as soon as I turn my laptop on and log into my Windows. Since this is the very first thing that pops up, it sure does leave an impression. In fact, I now remember the name of the website quite vividly and this is what the push notifications do best. The leave a long-lasting impression. As an advertiser, it’s your goal to make your brand recognized among the crowd. The behemoths are spending heap of money just to achieve this objective and with the help of push notifications, you can pull it off for yourself. The said website could have delivered the same message through emails but I receive hundreds of emails from other websites as well. So the chances of their message getting lost in the clutter and I hitting the delete button are much higher. Secondly, with emails, you’re only able to read the subject line spanning just a few words. You have to make sure to stand out using those few words using these few words. But the push notifications allow you more room to entice a potential customer/subscriber. And that’s not just my own personal experience. The statistics say that the push notifications skyrockets your open and click-through rates. In fact, given the push notifications ability to hit the nail right on the head, many big guns like FaceBook, Gmail, YouTube, Instagram etc. have started to use this mode to further their brands’ reach. 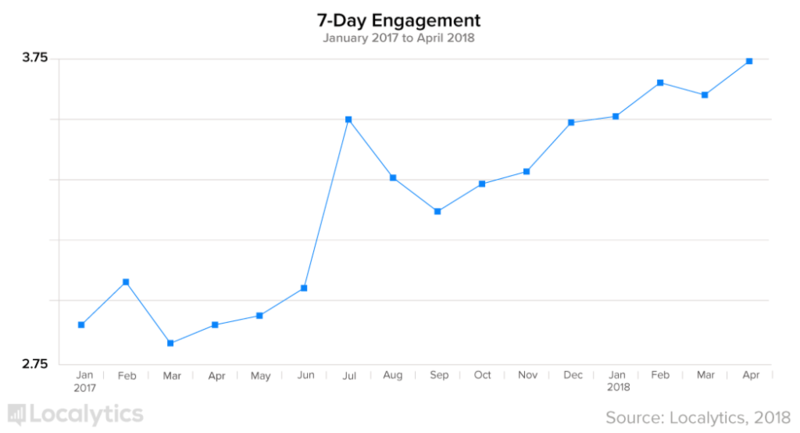 Increase in engagement (average number of sessions push recipients completed within the first week of receiving the message) over time. So the crux of this anecdote is that it’s about time that you should start looking to explore new boundaries in the field of advertising. Having said that, I just want to make one point clear. And that’s about the “Emails”. I just want to make sure that my above comparison of emails vs push notifications does not make you a dissident of the idea of using emails as an advertising platform. Make no mistake, email is still one of the best and economical medium of advertising. It’s just that the push notifications are much more effective. We can argue about the cost though. After sealing the effectiveness of the push notifications, let’s see what the MegaPu.sh brings on the table. Hailing from Georgia, MegaPush was started in 2017-2018. Therefore, during the writing of this article, (in 2018), the network does not boast a rich history which goes way back but even in this short span of time, it has generated some remarkable results. All you have to do is sign up for an account as an advertiser and Once you’re a member, you can now create Campaigns and start promoting your offers. There’s no fee for signing up. As an advertiser, you can create campaigns and publish them. Megapu.sh works on a CPC (Cost-Per-Click) basis and you’re allowed to set a budget per click which can go as low as $0.001. Though this largely depends on the geolocation. The subscribers of Megapu.sh receive your ad in their push notifications and your budget is consumed if they decide to click on that notification. Since this is a CPC network, you consume budget on per click basis instead of per view. 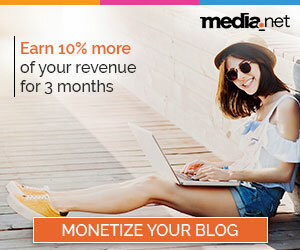 How does MegaPu.sh receives Subscribers/Traffic? If you’re a veteran advertiser, you must know the downsides of advertising to a spam or low-quality traffic. So before barging on this advertising network, it’s best to know how does MegaPush receives its traffic? Well, I had a small discussion with one of the MegaPush’s representative and inquired the source of their traffic. According to him, they’ve been running some ad networks like Bad Boys Network (closed now) and currently, Leo Cash which helps them in amassing genuine leads to later use them to advertise. So, as far as the spamming is concerned, this network seems to be covering their bases. After becoming a member, you may need to create campaigns to promote offers. Here’s how you can do it. A. Campaign Name: The name of the campaign. It’s for your own use. B. Link: The website where the visitor will be redirected. D. Message: 45 character excerpt to show below the heading. E. Select Country: In which country the ad will display. Select All Countries if you want to advertise globally. In addition to the above mandatory fields, you can also choose your budget per click, time or any particular ISP (Internet Service Provider) that you may want to target in your campaign. Lastly, you can also select the feeds to target so that your ad may appear in those feeds. Click the Preview button to see how your ad would appear on the computer screen. Click Create to publish your ad. 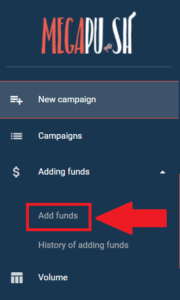 Before you create a campaign, it’s necessary that you have funds in your account to run the campaign. The minimum deposit that you can make is of $100. There are many ways you can deposit funds in MegaPush ranging from BitCoins to paying through your MasterCard, Visa or a Wire Transfer. Select the mode of payment from the list, enter the total amount that you want to deposit and then click Pay. The rest of the procedure is self-explanatory where you have to enter your information based on the mode of payment that you may use. Traffic from all over the world with more than 20 million clicks to date. CPC based pricing model so that you’re sure that every penny spent at least results in the target audience landing on your offer. From there, it’s the quality of your landing page that plays the key role in the conversion. Detailed targeting as you can target your audience based on their ISP, device, operating systems etc. Complete and detailed tracking thus no need to deploy third-party tracking systems. 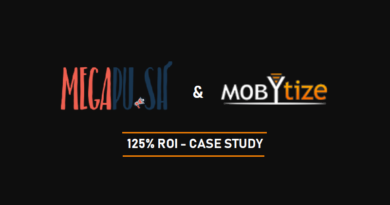 Megapush displays success stories of its users on almost a daily basis so you’re never short of the advertisers who have something valuable to share with you and therefore, there’s always an ample source of motivation as well as guidance as you can learn how they’re able to pull it off for themselves. An advertiser has shared his story of promoting casino offers in locations like Pakistan, Egypt and Italy. He didn’t put any great thoughts behind choosing these locations (since gambling is prohibited in Islam, therefore, choosing these countries (Pakistan and Egypt) to promote gambling offers actually confirms this claim) but created 3 campaigns to capture the leads. Long story short, he spent a total of 7,352 RUB ($111.52) which earned him an income of 29,070 RUB ($440.5). The second success story (which is even more exciting) is of a German guy who promoted BitCoin offers. So you see, there are hundreds of such high-end success stories testifies the potential of push notification marketing. Who is MegaPush Ideal for? According to me, every digital marketer, whether he sells his own product/services, does affiliate marketing, dropshipping, CPA marketing or is in the business of “selling” something, He should really venture into and take ahold of this revolutionary form of advertising. The earlier he gets on the train, the more the advantage of the early bird that he can reap. While interviewing with the MegaPush’s rep, one particular point caught my attention. He said that you cannot get more than 5% of their total traffic per campaign. 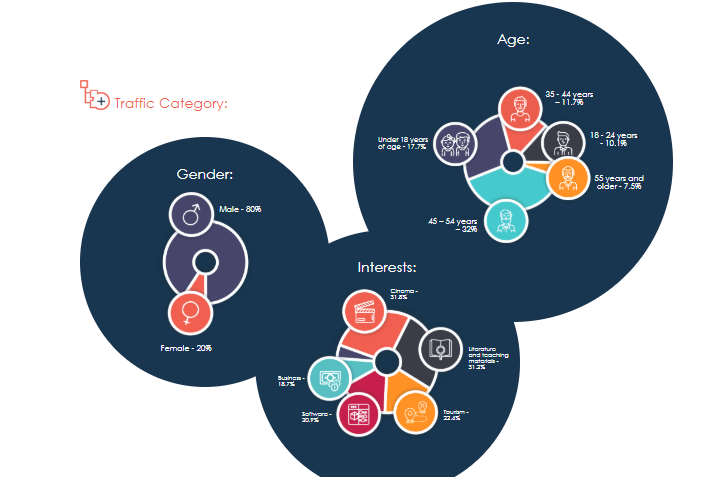 What this means is that hypothetically speaking, if the total traffic that MegaPush owns is 20 million, you can expect a maximum of (5% x 20 million) 1 million potential visitors per campaign. So in order to increase the number of visits (provided that you’re hungry for more), you may need to create additional campaigns. This downside is not a significant one but nevertheless, it’s a downside introduced for some reasons known by the MegaPush’s team only. 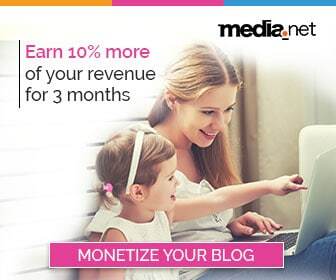 There’s one more way you can make money from MegaPush. And that’s by participating in its referral program. In the good old days, they were offering 7% of what your referral invests. However, due to constant abuse of its feature, the rate is now down to 3%. Still, it’s a decent way to make money online. BTW, here’s a helpful video that I found on Youtube. No doubt, the push notification technology is revolutionary which ensures higher deliverability and therefore, better results. However, this does not mean that blindly applying it will yield the same results. 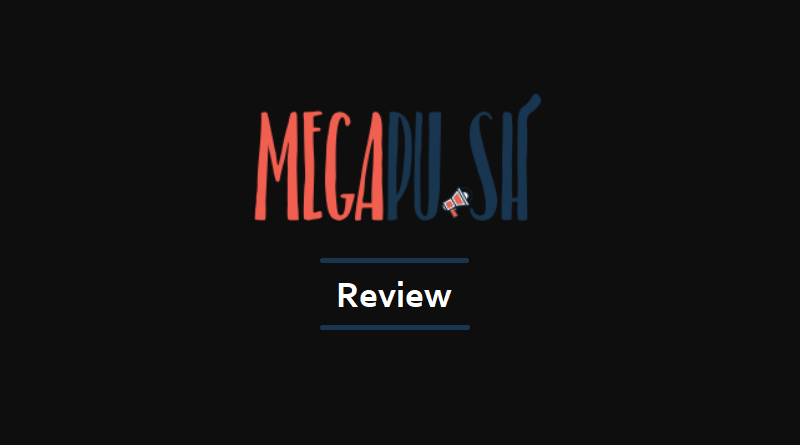 Just like any other advertising medium, MegaPush also needs to be dealt with smartly and if done right, you can definitely expect to earn more revenue per every hard-earned penny invested. Enough jabbering and let’s take some hard action. If you’re an advertiser, affiliate marketer, promote CPA offers or practice digital marketing in any form, it’s best to embark on this journey of Push Notification advertising at the earliest. 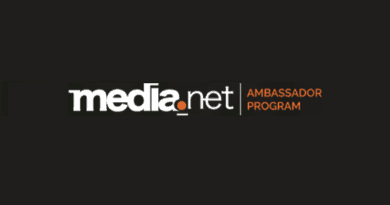 Let’s create an account at MegaPush to deepen your brand’s reach. 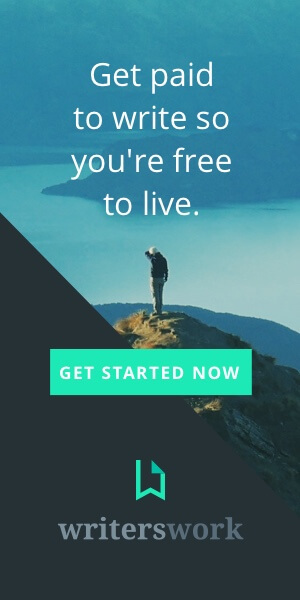 Just click here to create an account instantly.